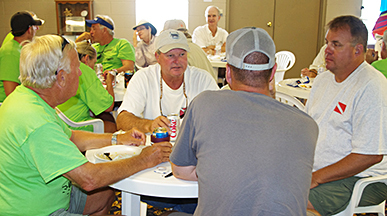 "We had the best turnout of boats and volunteers that we have had in years!" 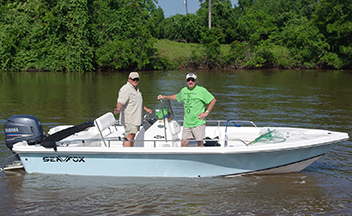 Bob Breakiron, right, and Peter Pappas searching the river for trash. Despite heavy rains earlier, approximately 25 boats participated in the cleanup on Sat, May 12. A commercial size dumpster full of trash was collected. Volunteers that manned the Churchill Bridge boat boat ramp collection station were, left, Tommy and Peggy Davidson, Melvin and Claudia Pechacek and John Wallace. Volunteers manning the FM 521 bridge boat ramp collection station were, left, Vanessa Taylor and Bill Jernigan. Ken Wright, middle, sat in for the photo. A hot dog lunch was served after the clean-up to volunteers at the F.O.R. Community Center. See Erma Vacek, volunteer. 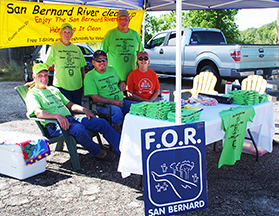 Rick Gardner (white shirt and cap) won the prize, a "Ski San Bernard" sun visor, for the oddest trash collected from the river – a magic 8 Ball that answers life's questions, only this one was waterlogged and just looked blank. Rick also found a nest of freshly hatched field mice that he smartly did not bring to lunch that would have caused a hasty exit of the women from the building. Ana Pogue, one of the F.O.R. 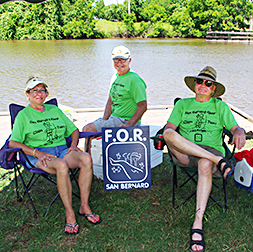 Board of Directors, and Peggy Davidson (Logo Committee member), volunteered to stay & clean the F.O.R. Community Center following the post-River Clean Up hot dog social. They did a great job. When they left, very tired, the community center was ready for the next event. Thank you very much.